Whether you’re going out on a selfie date, with a group of friends or with your significant other, you should always give yourself a little love when it comes to picking out the perfect outfit! The Valentine’s Day color scheme is a fun one, with different shades of red, pink, white and neutral colors, the possibilities are endless. 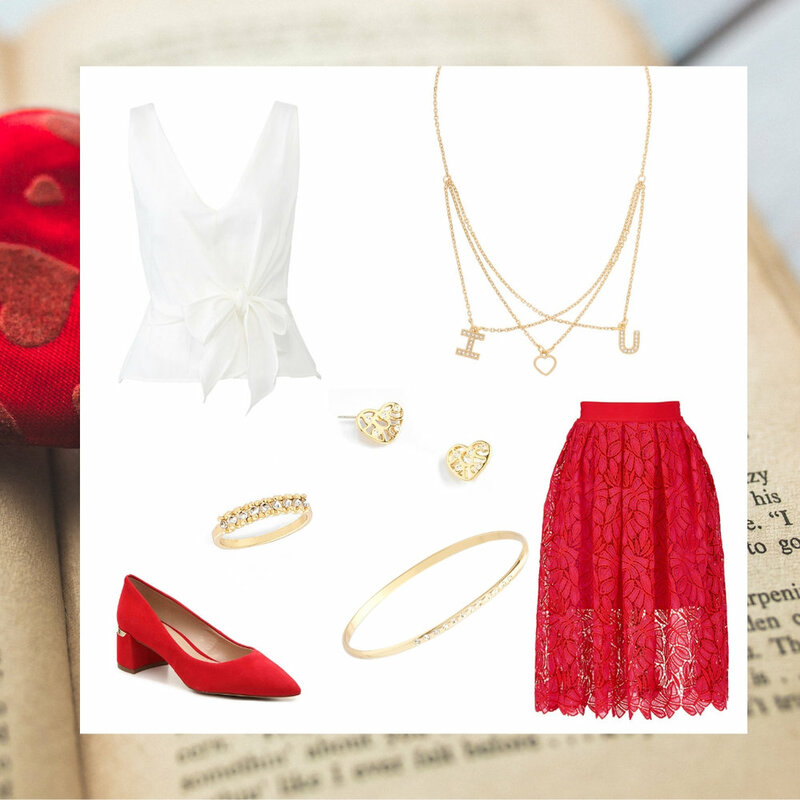 And knowing how hard it can be to find an outfit, we’ve hooked you up with 8 of our favorite St. Valentine’s Day looks. Keep scrolling! Take this look out with your girls on Valentine’s Day! This one features gorgeous pinstripe crop pants, beige bodysuit, and maroon ankle sandals. Add some sparkle to your outfit with our timeless faux pearl statement necklace, stud earrings and adjustable bracelet. Feel beautiful and edgy on your Valentine’s date in this unique, vibrant red dress with floral patterns and black ankle sandals. Accentuate this look with classic gold accessories such as our Nice & Bella braided hoop earrings and dainty rings. Classy and timeless. Show off your Valentines day spirit at work in this classy look. It includes a red, long floral skirt, white wrap around top and a red day heel with a hint of gold. Amp up this classic look with our lovely layered necklace, heart shaped earrings, crystal encrusted ring and simplistic bracelet. Wear this look for an elegant dinner party or a romantic date! The metallic dress and shimmery rose gold heels are perfect for any event you’d like to shine at. Keep Valentine’s day colors flowing in our beautiful rose gold choker, bangles and heart shaped drop earrings to make this look pop. Casual or out of this world? You decide! This look is beautiful in every way and stands out with the floral dress, which includes all the lovely pink and red shades. Bring neutrality to the array of colors with tan ankle sandals and our gorgeous rhodium plated jewelry. Our accessories include a long layered necklace encrusted with crystal stone pendants, large drop earrings and a floral inspired ring. If you’re planning on going casual this Valentine’s day, but still want to stand out, try this darling vintage inspired look! Pair a bold red full skirt, sheer long sleeve blouse and antique inspired black pumps. Every casual look deserves to stand out too, and this look does it perfectly with our gorgeous gold plated hoop earrings and ring encrusted with crystal stones. A day time jumpsuit is perfect for any day time event and even work! The pink jumpsuit and the clear heel, white open-toed mule bring love and friendship vibes. Accentuate the look with our rhodium collection geo figured necklace with faux marble, large edgy bracelet and layered ring detailed with crystal stones. Drop some jaws in this glamorous lace jumpsuit with open toed red heels. This look is perfectly accessorized with our textured gold plated cuff, eloquently detailed ring and tassel necklace with a ruby colored crystal stone. Take this amazing look to any evening event. Share your Valentine’s Day looks with us!